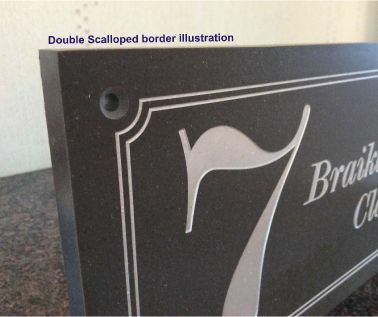 Easy to use the website, great price, quick turnaround and excellent finish to our order. Would highly recommend for any engraving needs and will use again. Excellent work fast delivery and exactly what we wanted. Compliment your business with one of our Granite effect Corian nameplates. 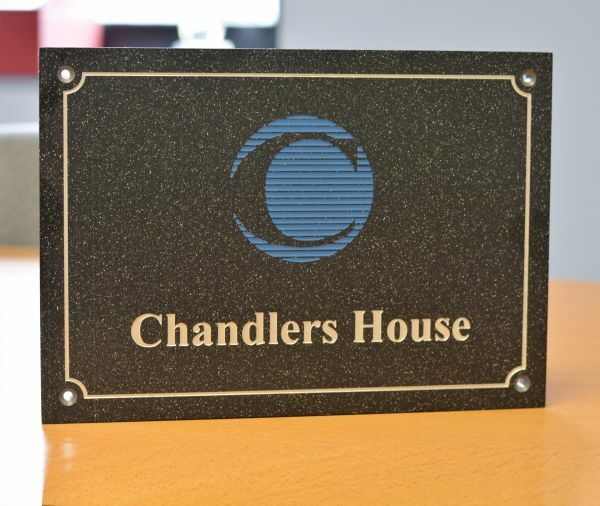 Deep engraved to your own requirements, incorporating logos if required and infilled with a long lasting durable paint, these Corian nameplates will sit proudly on display for many years. Supplied in a 12mm thickness with bevelled edges and manufactured by Dupont, Corian is made from a mixture of acrylic resin and natural minerals and are able to retain properties of real stone such as, the matt finish, considerable weight and that cold feel, whilst also having no variation in structure or flaws and cracks within its features, giving Corian a real advantage over stone. It is UV stable, fade proof, hardwearing and infinitely versatile, Corian is easy to clean and maintain. When properly cleaned, its nonporous surface does not promote the growth of mould and mildew. 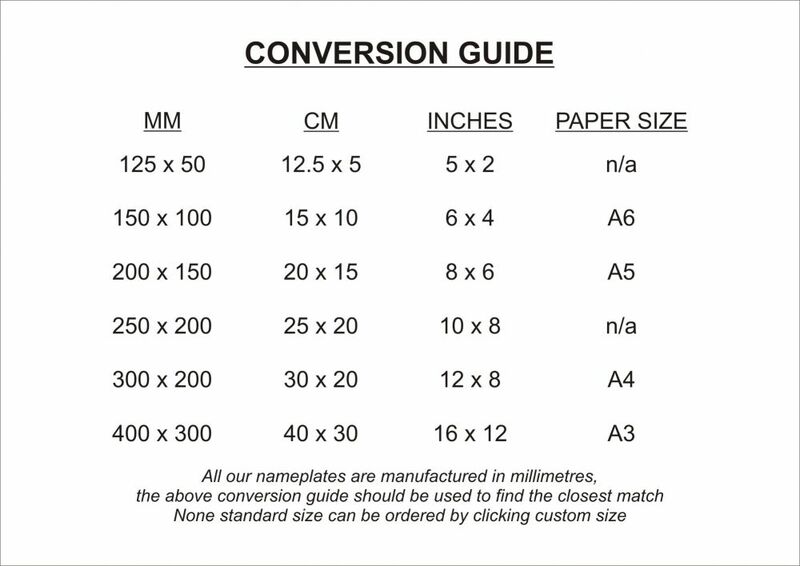 In addition, Corian® is GREENGUARD Certified® as a low-emitting material. Logo’s and borders can also all be included to enhance your nameplate. The standard border incorporates scalloped corners which surround and highlight the screws. Nameplates are supplied with suitable screws and powder coated caps by default or without any fixing at all should you desire. 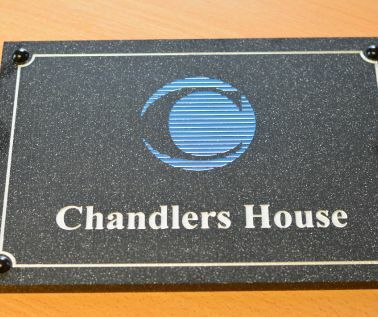 Granite Effect Business Plaques are supplied with 4 x fixing holes, screws and powder coated domed caps to conceal the screw head. To view a video tutorial on how to fix your plaque please click here. 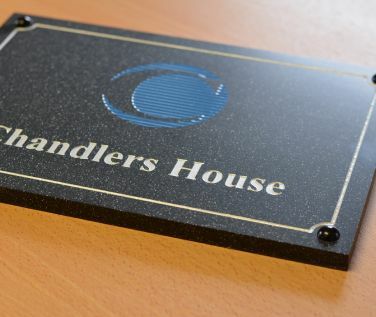 Plaques can also be supplied without fixings if you prefer. Corian is easy to clean and maintain, a wipe from time to time with a clean damp cloth should be sufficient. Its nonporous surface does not promote the growth of mould and mildew.